United States of America. Act of July 22, 1846. 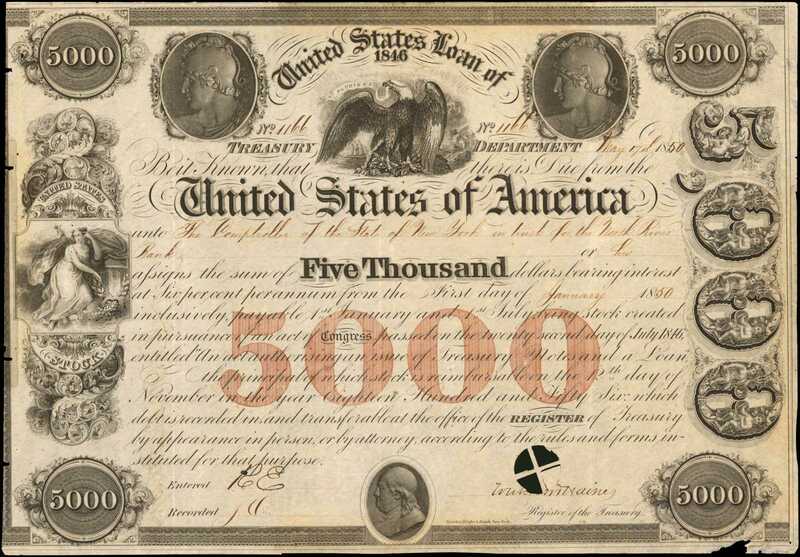 $5000 6% Loan Due 1856. Hessler X111I. Issued and Redeemed. About Very Fine.A great rarity, visually exciting, and remarkable on several accounts. A large format certificate engraved and printed by Rawdon, Wright & Hatch, New-York on bond paper. This example is issued May 17, 1850, to the Comptroller for New York on behalf of the circulation for the North River Bank (issued Obsolete banknotes and not to be confused with similarly titled "broken" bank). Large format and broad size. 30.0cm by 20.0cm. Extremely intricate certificate. Eagle at top center flanked by cameo heads with title above. Obligation across with blanks for issuance information. Left end female as America and Plenty. Right end, perpendicular "5,000" and very ornate. Red protector 5000 across bottom center. Transfer text on the back and accomplished here as well. Signed by the register, issued with embossed stamps. No. 1166. Important and very rare. Specimens from this series were not in the Vattemare Albums. The type is not plated in Hessler, although a few issued and redeemed examples are recorded by us in our pedigree search. The certificate has some edge nicks on both sides and pinholes, but is essentially whole all around. There is some light penciling on the back edge that appears to be in F.C.C. Boyds hand (comparing with annotations on Colonial notes from the Ford sales). The circular cancel touches the signature partially. This appears to be the finest of three confirmed. One has major condition problems, yet sold for nearly $4,000. The other is graded Very Fine 30 Net by PMG and sold for $15,275 in January 2017. Once inside the cancellation book and removed, losing some of the left edge details and with minor dismount remnants. The offered example is striking to behold and worthy of a runaway price from collectors of classical bonds of this style and great rarity.From the John E. Herzog Collection; private purchase (with unidentified tag).